It was always a tradition growing up to have a bone-in honey baked ham with our Easter dinner. The ham was sweet and salty. My mother used the bone and any leftover ham to make split pea soup and her favorite layered ham, cheese, and potato casserole the following day. Every Christmas Day my brother-in-law bakes an entire bone-in fresh ham. This is completely different from the pink version we had at Easter. 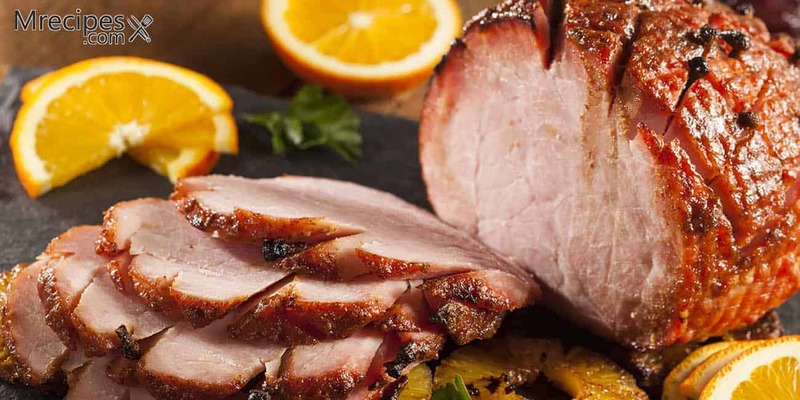 This ham has a crispy, fatty, outer layer and is extremely savory. The only drawback to this is that he has to nurse the ham all day to get it to the right internal temperature and still have it be moist on the outer most layers. It is a delicious labor of love. In this article we will explore smoking a pre-cooked ham that does not need to be tended to all day. We are not curing a raw ham in the smoker because that would require some alchemy using the proper salts, sugars, and possibly nitrates. It also takes a very long time to make sure it is cooked all the way through. We’ll leave the curing and smoking of a fresh ham to the experts (for now) and start with a pre-cooked ham that you can get from your local market. No need to order an expensive ham from a specialty purveyor. When buying a pre-baked ham you may have options. Some hams are cured with sugar and salt. Other hams are smoked, which is common. And, sometimes you will find just a baked ham. Any of these will work for this recipe. Let’s start by smoking the ham with a sweet and spicy glaze in a Masterbuilt Electric Smoker. We’ll then add some potatoes to the smoker. The last item will be pineapple rings to accompany the protein and starch. You can round out this meal with lightly dressed salad greens or make a classic green bean casserole. Here is a recipe for Green Bean Casserole straight from the source that invented it in 1955, Campbell’s. This recipe will easily serve 6 to 8 people with leftovers. Plan on 3 to 4 hours for both preparation and cooking. 1. Remove the ham form the packaging and give it a light rinse under cool water to remove any preservatives and excess seasoning. Pat it dry with paper towels. Place the ham, flat side down, on the lined sheet pan. Allow it to come to room temperature for 30 to 45 minutes. 2. Optional: Score the ham at 45 degrees in a diamond pattern that penetrates approximately 1/2 inch into the ham at 1-1/2 inches apart. If using a spiral cut ham you don’t need to do this. It just helps the glaze to stick better and infuse into the ham. 3. Place the water in the pan at the bottom of your smoker. Fill the drawer or tray with wood chips. Preheat the smoker to 250°F. 4. Place the ham in the lower section of the smoker, allowing room for the sides on the racks above. Place the digital thermometer in the thick portion of the ham. Open the top vent. Cook the ham until it reaches 130°F. This may take 60 to 90 minutes, depending on the size of the ham. You will need to check at 60 minutes. Replenish the wood chips and water approximately every 45 minutes, if needed. 5. While the ham is smoking, prepare your glaze by whisking together and simmering the other ingredients in a saucepan until just slightly thickened so it will stick to a pastry brush and the ham. It should resemble a thick and slightly runny syrup that coats the back of a soup spoon. 6. Remove the ham from the smoker at 130°F and completely coat it with the glaze using a pastry brush. Be generous. Return the ham to the hot smoker and cook until the internal temperature reaches 140°F and the glaze is dark but not burned. This should take an additional 60 to 90 minutes (approximately 2-1/2 to 3 hours). Remember that the ham is pre-cooked, so you are just heating it through and adding additional smoke flavor. This is also the time to smoke your sides. 7. Remove the ham to a cutting board and tent it with foil for 10 to 15 minutes before slicing. Serve with smoked potatoes and pineapple rings. Recipes follow. You will want to place your potatoes and pineapples in the smoker right after the glaze goes on the ham. Use small potatoes for this recipe due to the moderate temperature of the smoker. Larger potatoes generally need a higher temperature to smoke. Disposable foil pan to fit potatoes or a sheet pan lined with foil. 1. Clean and dry the potatoes. Place them in the pan and coat evenly with EVOO, salt, and pepper. 2. Place the potatoes on the top rack of the smoker as soon as you glaze the ham. Smoke for approximately 60 minutes. Check them with a fork for tenderness. Continue to smoke until soft. 3. Remove the potatoes when cooked through. Smash each one just to break the skin. Gently fold in the butter and season with salt and pepper. Keep them in a warm oven until the ham is finished, if necessary. You can double this recipe if you have room in the smoker. I place the rings directly on the rack over the ham. If this is too messy for your liking, use a sheet pan. I also don’t smoke the pineapples until soft. I prefer a bit of crispness in the fruit with a hint of smoke. Feel free to modify to your liking. I also add salt because it tends to enhance the sweetness of the fruit in a strangely delicious and chefy way. 1. Cut the top and bottom off of the pineapple. Cut the pineapple in half at the center right at the diameter. Remove the cores of each half with a sharp paring knife and a steady hand. Remove the tough outer skin. Slice into 1/4 to 1/2 inch thick rounds. If using already cut rings, drain them on paper towels to get rid of excess moisture. 2. Place the pineapple rings in a bowl and coat them lightly with the maple syrup. Sprinkle with the salt. 3. Place the rings on the rack directly above the ham. Allow the juices to drip onto the ham. If this seems too messy, place the rings on a sheet pan and turn them over at 30 minutes. 4. Smoke the rings for approximately 60 to 90 minutes, checking at 60 minutes, until just fork tender but not falling apart. 5. Remove to a plate and serve at room temperature with the ham slices. Don’t forget to add a salad or some green beans to complete the meal. I have yet to try this, but I am pretty sure you could cook a green bean casserole in your smoker. While this came out very tasty.. the times for cooking the ham and the potatoes was way off for me.